The five-mile extension will connect South Phoenix to the regional light rail system, operating from downtown Phoenix to Baseline Road. Valley Metro is offering a one-of-its-kind STEM-focused program in South Phoenix. Engineers of the Future is a mentorship program for seventh and eighth grade students along the South Central Extension. Engineers working on the light rail extension are mentoring students during the school year and provide support on student design projects. As part of the program, students recently visited Arizona State University in Tempe, learning more about higher-education and meeting with students and faculty. "Engineers of the Future has helped me understand math better and do better in my classes too,” said Jasmine Romero, Engineers of the Future student from Cesar Chavez Community School. Engineers of the Future is one of the programs being offered to the community as part of the South Central Extension career and student development plan. To learn more about the program click here. There are current job openings to join the South Central Extension team. Learn more about the available positions. Now accepting applications for the 2019 South Central Extension Summer Internship Program. Click here for program details and the application, or view the file under the Workforce Development tab. We appreciate all those who came out to the city of Phoenix and Valley Metro open house-style meetings this past week. All the materials from the meetings are available under the Design Update Public Meetings tab. Community input has been and continues to be an important element in the design of the South Central Extension. On September 26, 2018, the Phoenix City Council voted to continue to move forward with the current two-lane design for the South Central Light Rail Extension. The vote followed a previous council decision, which requested Valley Metro look into a four-lane design and conduct extensive community outreach. With council approval, Valley Metro staff and city of Phoenix will continue to advance the project and work closely with the community. Valley Metro is continuing to survey the South Central Extension to identify locations of underground utilities. Surveying will cover the entire light rail alignment from Baseline Road to the downtown area with an expected ending period in early 2019. If you have additional questions, please contact one of the Community Outreach Coordinators listed below. Thank you. What is the South Central Extension? The extension will connect with the current light rail system in downtown Phoenix, and operate south to Baseline Road. The expansion adds new stations, track, and art elements to the project, and will make the unique offerings of South Phoenix more accessible to people around the Valley; attracting new customers, businesses and jobs to the area. The project also includes a transit hub in downtown Phoenix, improving access to educational opportunities, entertainment and employment centers around the Valley. With the voter-approved Transportation 2050 citywide transportation plan, the timeline for the South Central Light Rail Extension was advanced by 11 years. In January 2016, the Phoenix City Council approved advancing the opening date of the South Central Light Rail Extension from 2034 to 2023. Learn more about T2050. The South Central Extension Community Office is open at 5040 S. Central Ave, Phoenix. Monday - Wednesday, 9 a.m.-5 p.m.
During office hours or by appointment, community members and business owners will be able to visit with project staff to ask questions and learn more about the extension, or get more information on upcoming business assistance programs. To make an appointment, call the office at (602) 687-8585. 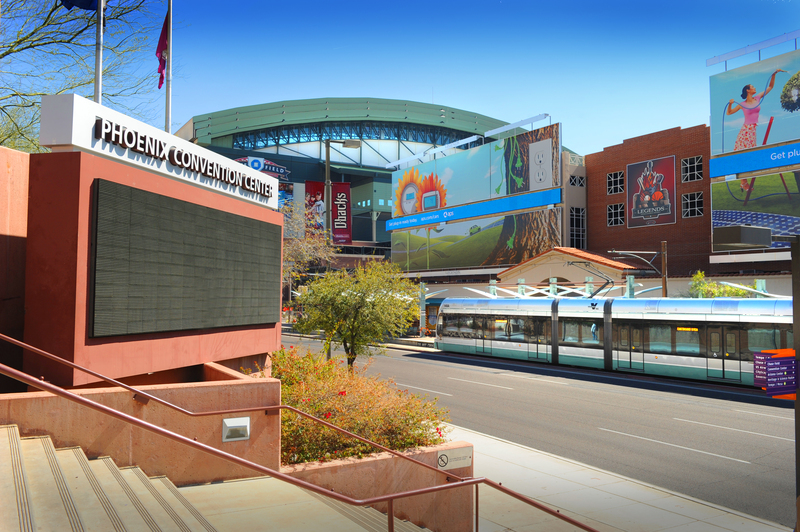 Valley Metro and city of Phoenix kept a strong focus on staying local when creating the office. The office space is leased by a local property owner, a local contractor completed the renovations, the furniture is from the furniture store next door, and the eye-catching exterior mural was created by a Phoenix artist. View more photos of the office opening at flickr.com/valleymetro. Join the team or get training for future opportunities!